Hi. Is the phone still for sale? Yes. The phone is still for sale. Cool. I would like to buy it then. Create your own form fields for the ad posting process with the built-in form builder. 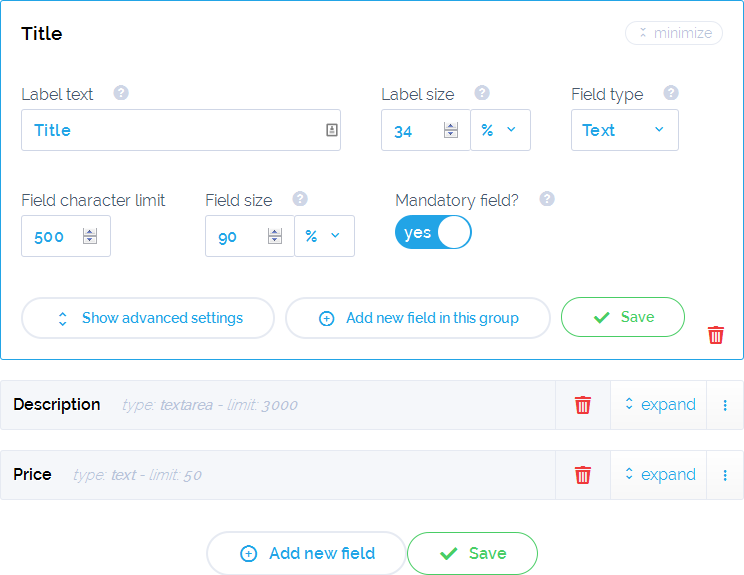 You can create unique forms for each category in your website with as many fields as you want. The theme comes with it's own fully featured Auto Classifieds plugin. You can import a full list of car, motorcycles, campers, trucks and tyre makes along with custom form fields for each auto category and run your auto classifieds site like a professional. You have all the time in the world to get to know the theme and to fix any theme issues that you might have. The theme has a built in payment system that you can use with PayPal or STRIPE. You can charge your users for the posting of ads and then you can upsell with ad upgrades like "featured ad", "highlighted ad" or "push ad". The theme comes with a powerful ad form editor and category editor. You will be able to create customizable forms for each ad category and then choose from over 2000 icons to show next to a category name. Your users will be able to register on your site with an email address but also with their Facebook or Google+ account. No need for extra plugins to achieve the functionality of a fully working classifieds website. Easily change the url structure for your ads. This is great for SEO and you will also be able to use the theme for any niche you want. The theme comes with a fully functional auto classifieds plugin. You can import a full list of car makes and custom form fields for your auto categories. 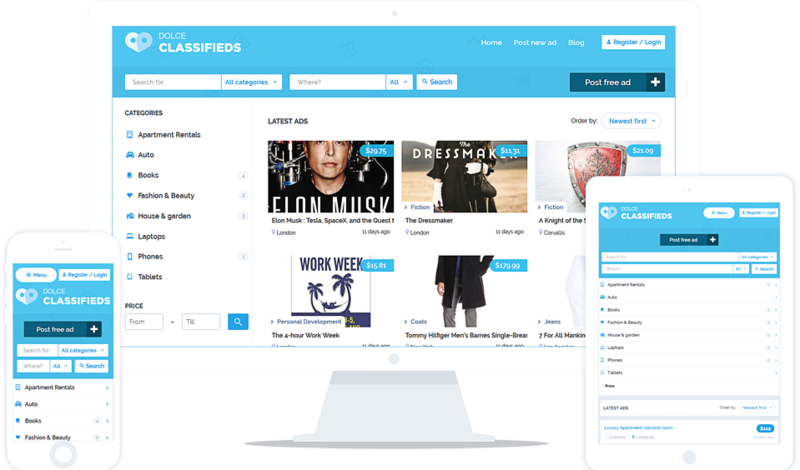 This theme will help you build your own classified ads in minutes. Once you install it you'll be ready to go. No need for a lot of configurations, no need for 10 extra plugins, just the theme. We built this theme based on client feedback and we'll continue to update the theme and make it even better. The theme comes with a powerful built in form creator. You can create custom form fields for each category in your site. All users register and edit their information from the front-end. At no time are they allowed to go in the WordPress dashboard so they will not even know you are using WordPress. You can use PayPal or STRIPE to accept payments. More payment options will be integrated in future versions. You can choose from a selection of payment settings. You can set a price for the posting of an ad and also charge users for ad upgrades like: featured ad, highlighted ad or push ad to top. All payments and ad expiration is done automatically by the theme. If you have a STRIPE account you can accept credit card payments. You can create any number of categories and subcategories. All with their very own icon. You have over 2000 free icons to choose from. Ads can be posted free of charge or for a certain fee. You can choose if expired ads are removed from the site or they can just be paused so they don't showup in the site. Your users can login or register with just an email address or if you want they can login with their Facebook or Google+ account. The admin of the website can edit every ad. The admin can add/delete images, change ad information or delete the ad. We have included a detailed documentation file along with the theme. You will learn what all the settings pages and admin pages are used for and how the theme works.